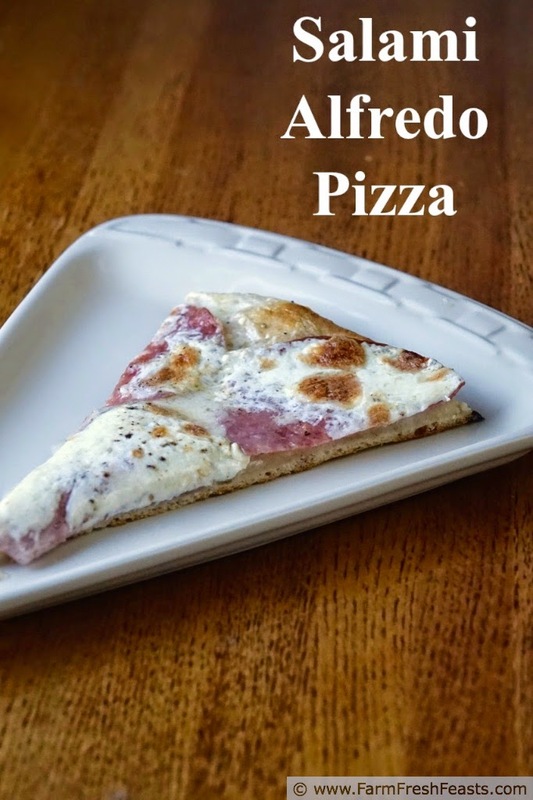 Gooey cheese and spicy salami on top of creamy Alfredo sauce for a hot mess of a pizza. A subtitle could be: where to find the tools you need for successful pizza at home. 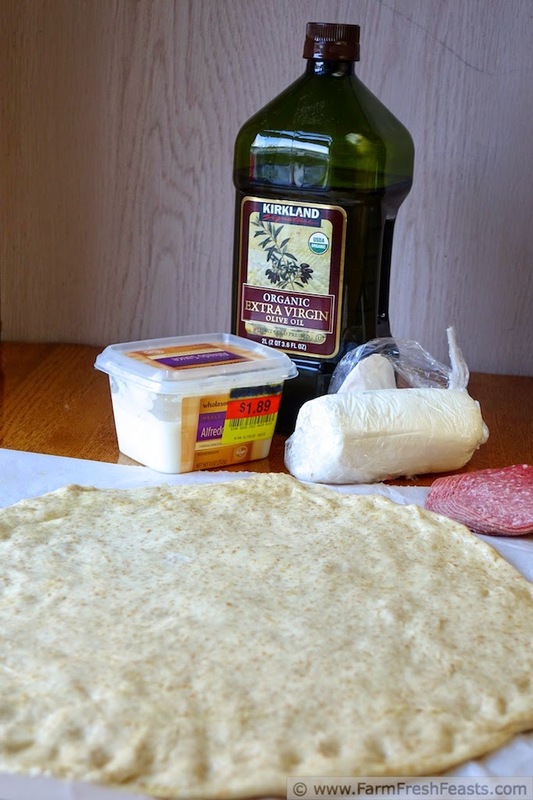 Almost as many times as I've shared a Friday Night Pizza Night recipe here I've also said to preheat a pizza stone if you've got one [one glaring exception would be deep dish pizzas which I cook in cast iron skillets]. Now I'm going to say that if you like to make pizza at home and don't already have a stone, GO GET ONE. I took my stone out to make room for the turkey last month and didn't even notice it was gone when I made a deep dish Thanksgiving leftover pizza [with green bean casserole--who knew?]. Last weekend I preheated my oven while I was dithering over what kind of pizza to make for my birthday**. I assembled my pies, opened the oven door to slide the first one off the peel onto the . . . . oops. Well that was unexpected. I ended up using a cookie sheet and my crust was no where near where it usually is crispness-wise. The stone really makes a difference. I even wrote an ode to mine. Here's a link to King Arthur Flour where I bought my stone, and an Amazon affiliate link for good measure . The shape shouldn't matter, but I like how my rectangle fits in my oven and how I can easily fit multiple dishes on it when I'm baking. My stone is broken, but unlike a casserole dish I can just push the edges to close approximation and rock on. Compared to the cost of buying a couple of pizzas every weekend, it paid for itself 15 years ago. Ditto on the pizza peel [Amazon affiliate link to my sanity-saving pizza peel ] which makes getting the pizza in and out of the oven terribly easy. Triple ditto the parchment paper, though I keep on buying that stuff so it's not like it pays for itself [silicone mats do not work in this instance]. My kids just don't hear such a wide array of colorful language when I use parchment paper. There is a pizza recipe here, I promise. This was a hot mess of a pizza, but boy did it taste good. The pictures are lousy, but I decided to share it anyway because of the flavor. We had salami left from an antipasti dinner, prepared alfredo sauce because I cannot resist a magical markdown sticker, and mozzarella because people don't make a lot of caprese salads in the winter so there's marked down mozzarella at the fancy cheese counter. You'd think that I'd know better about using thawed mozzarella slices, but you'd be wrong. 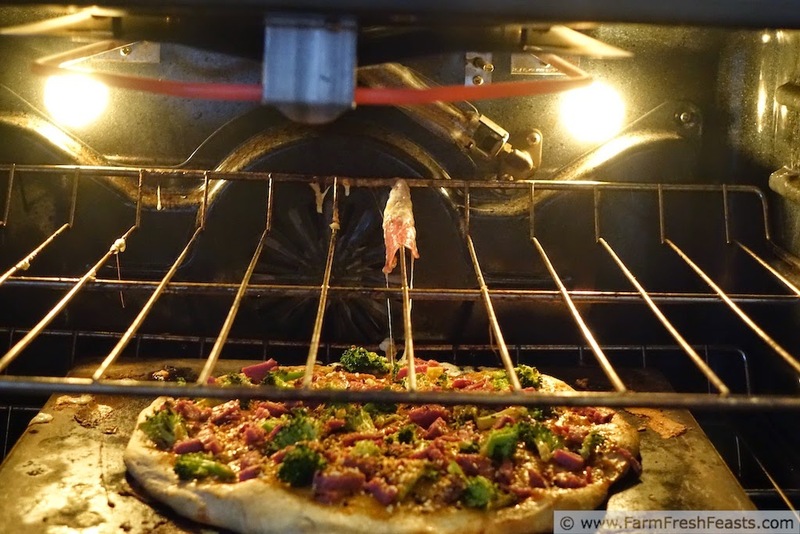 This pizza made a gooey, drippy mess all over the back of the oven when I lifted it up to broil the top (photo at the end). It was worth it. Preheat the oven to 450 degrees Fahrenheit. On an oiled piece of parchment paper, stretch out the crust to the shape and size that it feels like being [nevermind what you're interested in, crusts sometimes have a mind of their own. Sentient yeast, I think.] Brush with olive oil. 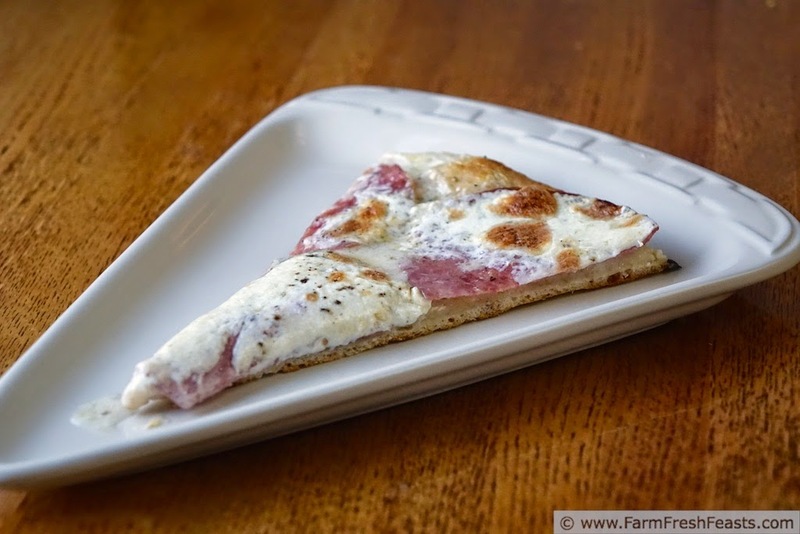 Spread a thick layer of Alfredo sauce over the crust, and top with overlapping slices of salami in a pretty pattern. 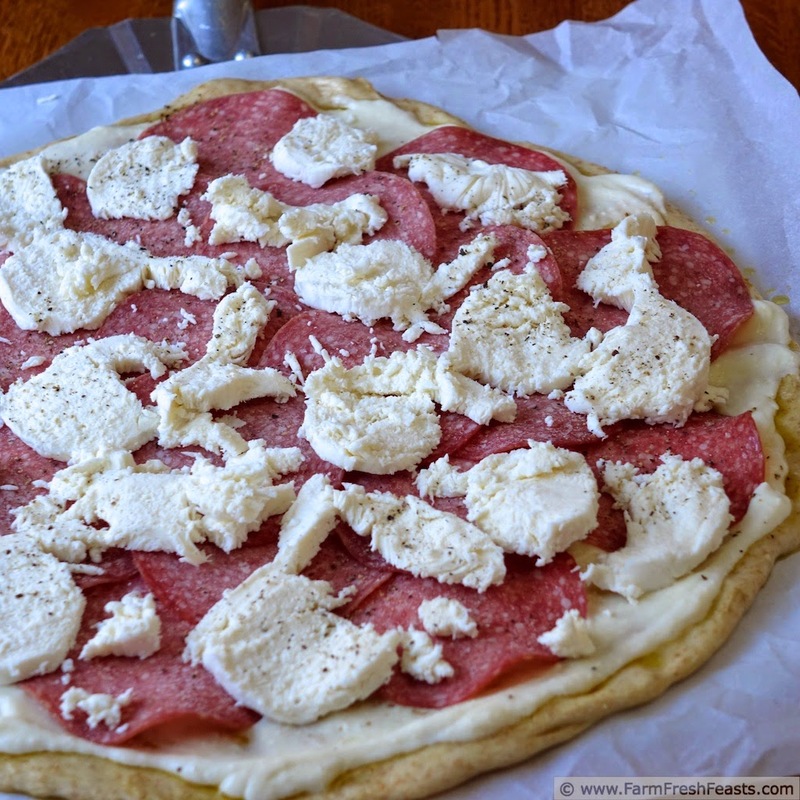 Top with mozzarella--if you use sliced fresh (or especially previously frozen) mozzarella it's going to be a drippy hot mess. Stick with it, as the flavor is wonderful. Grind some pepper over top of the pie. Bake for 5 minutes, then remove the parchment paper and turn on the broiler. Broil for 3-5 minutes until the cheese is browned, bubbly, and dripping all over the oven. Let the pizza cool on a rack for 5 minutes to firm up, then slice and serve. Hopefully someone else will clean the oven. No Beef and Broccoli Pizza was harmed in the aftermath of the broilage. But yeah, clean up's a b*#@h.
**Yes, I made my own birthday dinner. I did a pepperoni & ham w/tomato sauce pizza and a artichoke/kalamata olive/green olive/Old Vine Zinfandel-soaked sautéed mushroom/feta w/roasted garlic oil sauce pizza. Other than a less-than-stellar crust due to the lack of stone, they were an awesome way to celebrate my birthday. We got cheesecake from The Cheesecake Factory for dessert--I know my strengths. Oh man, what a mess, but fresh mozzarella is almost always worth it. My pizza crust is so much better since we've been using a stone. Night and day actual, and it was always sticking to the cookie sheet. Not so the stone. See! I don't want to say I told you so. Instead I'll say that the pizza we had in August was delicious--as was the company of you and you're sweetie!